The exponential response has been the typical medium response in the first part of this book. Examples are the creep compliances of the Kelvin–Voigt and Zener models ( 3.30) and ( 3.30) as well as the relaxation responses of the Maxwell and Zener models (( 3.37) and ( 3.45)). But in many complex media this model is too simple, and power laws are observed instead, which may both be in time-domain responses and in the frequency-domain. As the Fourier transform of a temporal power law is itself a power law, these observations are equivalent. 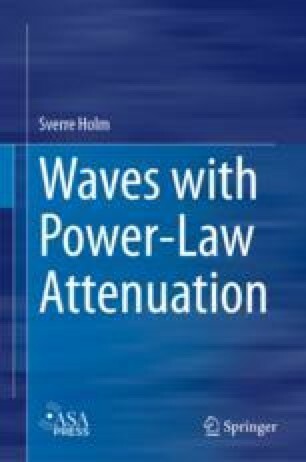 The first section therefore starts by reviewing empirical observations of power laws in the frequency and time domains.